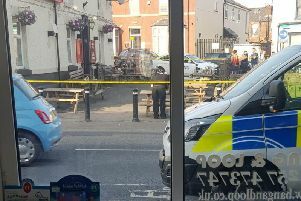 A Wigan woman who drunkenly ploughed into a parked car in front of a packed beer garden, told justices she fled the scene to escape angry onlookers. Emma Gaskell, of Park Road in Orrell appeared in the dock at Wigan and Leigh Magistrates’ Court charged with driving over the legal alcohol limit and failing to stop after an accident. The court heard how the 35-year-old, who pleaded guilty to both charges, had crashed into a right outside the busy Gathurst Station Inn. Heather Cooper, whose car was damaged in the incident, told police that she had been at the pub attending a charity quiz when the collision happened on July 5. Prosecuting, Tess Kenyon, said: “Ms Cooper had left her car parked and locked on the main road. “She was sitting in the beer garden at around 9.30pm when she heard a bang. “Someone said ‘it’s a black car’. She could see a family driving a silver Audi doing ‘a million-point turn’. “She was screaming for her to stop. Two men ran past the victim as the incident was unfolding and managed to take photos of Gaskell’s car before it “shot off” down the road. Wigan police were informed of the crash and found that the rogue driver was registered to Park Road. On arrival, there was no sign of Gaskell, but a neighbour gave officers a previous address, on Latimer Close also in Orrell. She was eventually apprehended when the police found her at the property with a man who had come to fix her damaged wheel arch. “The officer saw a female walking away from the address,” said Ms Kenyon. “Initially she stated that she hadn’t been drinking. “Then she said that she had been drinking but had not been driving. “Then she ran but he chased after her. Gaskell, who was found to be a little under twice the legal drink-drive limit when breathalysed, told magistrates that she “downed a load of JD” when she arrived at the Latimer Close home, just before being apprehended by the police. “My mum recently passed away,” she told the court. “My dad has only got two weeks to live. “When I had that little bump all these people started chasing after me. “I had banged my wheel so took my car to a previous address. “I downed a load of JD and when I walked to the shop that’s when the police were already there - that’s why I was more over the limit. “I know it’s no excuse. I have just got a lot on. Magistrates inquired whether Gaskell would be suitable for a curfew, she said that although she finishes work at 4.30pm, the curfew would have to begin at 7.30pm so that she could see her father. “I didn’t realise how serious it was,” she said when told she would be given a tag. She was given a curfew for eight weeks, disqualified from driving for 16 months and ordered to pay £170 of costs.